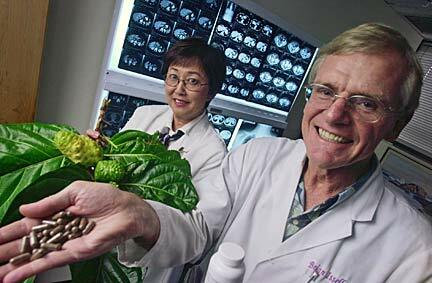 Dr. Brian Issell, right, holds noni capsules while research nurse Faith Inoshita holds a noni plant in Issell's office at the University of Hawaii's Cancer Research Center. Cancer Research Center of Hawaii researchers are getting reports from patients taking noni that they have less pain that interferes with activities. "That is exciting to us. It may be reducing the pain people experience, but we can't say. It's too early for a definitive conclusion," said Carolyn Gotay about the center's study of the fruit's medical value. What: Free lecture on "Noni -- Does It Help Cancer Patients?" Dr. Brian Issell, internist, oncologist and clinical sciences program director at the University of Hawaii cancer center, is principal investigator of the study, which began in 2001. The noni plant was used in traditional healing throughout Polynesia and is being promoted worldwide for all kinds of health problems and diseases. "It's a $2 billion product with incredible commercialization," Issell said. "We need to know if it helps more than harms people." His study is the first to look at the effects of noni on people and see if it does what ads claim. "We've seen pretty much improvements across the board when we look statistically, but these are early days," Issell said. "It's not telling us it's going to help more than harm people, but what dose we will test in the future." The team, including Faith Inoshita, clinical research nurse, is trying to complete the first phase of the study to find the right dose that will be effective for people, Issell said. Then the researchers will move to the next phase comparing that dose of noni a placebo. Different doses of freeze-dried extract of ripe noni from the Indian mulberry plant are given to groups of five patients. Participants have advanced cancer that no other treatment would help. Capsules are increased gradually from four a day to 24 and the patients are followed to see the effects. "We have been seeing increasing improvement in quality of life measures," Issell said. "It's very interesting. We're getting improvement at higher dose levels compared to a lower dose." Dr. Adrian Franke, associate specialist, and Laurie Custer, research associate, are analyzing the ingredients of noni, as well as blood and urine samples from patients, to see what chemicals may have anti-cancer activity. "We're measuring different markers," Issell said. "Once we have something we can feel confident about, we will use it to standardize noni because there are hundreds of different products now from juice, with additional things to mask the dose." Noni Maui is providing fruit grown on the Big Island for the study, which requires a consistent supply, Issell said: "We have quite a lot of capsules and will continue up to 40 (per day) if we need to." The first phase of the study began with National Institutes of Health funding and it is continuing with support from the Hawaii Community Foundation, Issell said. He said the issue with cancer drugs is to find the maximum tolerated dose that's most likely to have an anti-cancer effect. "Here, we haven't found the maximum-tolerated dose," he said. "We have to find the optimal quality of life sustaining dose. It's a complex question." Patients fill out questionnaires about how they're feeling, how their pain is, their fatigue and how they function. Gotay said patients are still tolerating the doses with no side effects. "We haven't observed any worsening of the quality of life. In fact, even though these patients tend to have advanced disease, their quality of life has pretty much maintained steady or gotten better in some cases." She said they're looking at the well-being of the patients from many aspects and "people are holding their own." The participants "are amazingly committed," Gotay said. "They have serious conditions and high hopes for treatment and they're very eager to take their pills. They're very conscientious about it. They're trying to help us and themselves, too, and future patients. "It's a long ways from even identifying, say it were to work, why it works, what are the active ingredients," Gotay said. Noni is a substance that hasn't followed drug lab development, so it isn't known exactly what's in it, how it works on the body or what kind of patients it would make a difference in, she said. For instance, she asked, "Would it be effective in people with earlier stage disease? We can't test that in the (present) study." Issell gets inquiries about noni from all over the world, Gotay pointed out: "That's partly why we are so cautious. We want to make sure (of the results)." Franke and his team is looking at how the ingredients affect different systems of the body, Gotay said. "There are so many different possibilities of what might be going on." He gave different doses of noni to healthy volunteers -- Cancer Research Center employees -- and drew their blood over an eight-hour period to see how noni processed in healthy people to compare with cancer patients. For more information about the noni study, call the clinical trials unit, 586-2979.